Since the tragic events of 9/11 the United States has used a lot of resources to upgrade the security in and around air travel. One of the ways that this was accomplished was in the expansion and further development of the Federal Air Marshal Service. The FAMs are tasked with blending in with the everyday passengers flying the skies over the United States to watch over the flights and ensure that no acts like what occurred in 2001 will be repeated. The threats they face on a day to day basis can range from frisky couples joining the “mile-high” club to plots to hijack a plane mid-flight. In the last few years Liam Neeson has re-emerged as somewhat of an action star. In the early 90s he cut his action movie teeth playing the role of Peyton Westlake / Darkman in the Darkman. In 1999 he landed the role of Jedi Master Qui-Gon Jin in the first Star Wars prequel, The Phantom Menace. From there he drifted into roles that were a bit less action oriented. In 2008 he burst back onto the action scene with the surprise hit Taken. Since that time he has become the actor to get if you are looking for an “older” guy to be your movie badass; see The A-Team, The Grey, Taken 2, and The Dark Knight Rises. Non-Stop is the next installment of Liam Neeson as the older, but old-man strong, hero. 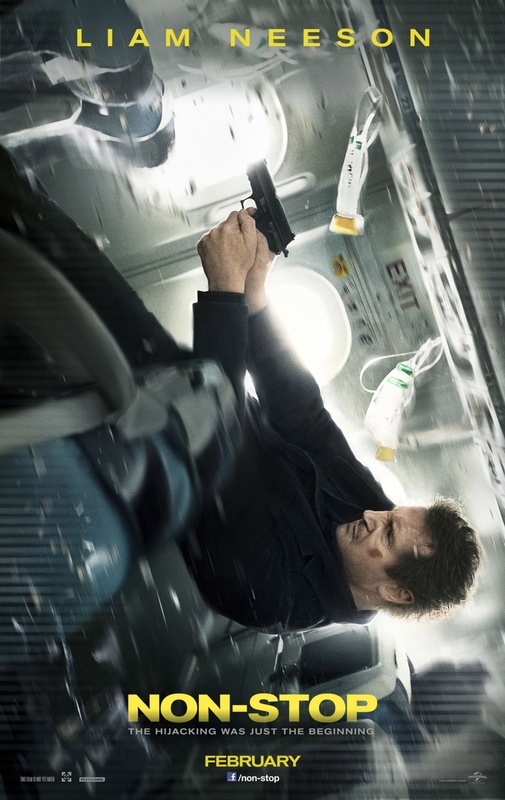 This time, Neeson plays the role of Federal Air Marshal Bill Marks. Marks is not your polished hero type character that you are used to out of Neeson, he is a very troubled man. Marks battles a drinking problem and is very anti-social, to say the least. You could easily seem him as the type of guy who would wake up one morning and say, “F*** it, I’m gonna waste those fools today,” and then go postal. The story told in Non-Stop rests on the shoulders of Neeson and his ability to portray a drunk, depressed, anti-social guy, who also just happens to be a highly trained Federal Agent. The story told in Non-Stop is an interesting one that will keep your attention if you enjoy a good “whodunit”. Marks begins to receive mysterious text messages describing a plot to kill a passenger on board the plane every 20 minutes until a ransom of $150 million is paid. Marks puts all of his training into action as he methodically goes about the business of tracking down the threat without alerting the passengers as to the danger they are in. Along the way he is faced with hurdles and challenges that seem to implicate him as the real threat. The story is complicated and requires a little more attention than some movie goers like to give; a poorly timed restroom break in the middle of the movie or a talker sitting next to you can ruin this movie’s fun. It also doesn’t move at a very fast pace; this is ironic considering the plot is that someone dies every 20 minutes. It develops in a very deliberate and methodical way with the viewer never really knowing what is fully going on at any given time. The emotions of the movie also build in a very slow and deliberate way so that by the time the movie build to its climax, the tension is at its highest point. At the climax, the story goes off the rails a little. Throughout the movie you are wondering if what is happening is a personal attack against the airline, a terrorist attack, or even a personal vendetta against Marks. When the baddy and motive are actually revealed, don’t be surprised if you find yourself scratching your head. The motive that is given just doesn’t fit the story and the characters that are provided. The other two main characters in Non-Stop provide balance and the emotions that the story needs, if not the actual details. The row mate to Marks is a woman named Jen (Julianne Moore) and she adds a bit of levity to offset the always serious and brooding Marks. The flight attendant, Nancy (Michelle Dockery), is the rock that Marks leans on when his paranoia won’t allow him to trust anyone else. The rest of the cast consists of your stereotypical figures that always seem to make their way into these types of movies; I won’t ruin your fun here. Liam Neeson continues with his trend of grizzled hero movies in a story that is a bit complicated with a somewhat unfulfilled ending. Overall, Non-Stop is a good second choice movie if you insist on going to the theater this weekend and you have seen everything else. I won’t say that I didn’t like it, but I also won’t commit to saying I did. Good review Michael. It’s a tense movie, that may not always make perfect sense, but kept me on-edge just about the whole time I was watching it.